Heuristics are “rule-of-thumb” design principles, rules, and characteristics that are stated in broad terms and are often difficult to specify precisely. Assessing whether a product exhibits the qualities embodied in a heuristic is thus a subjective affair. If you inspect a prototype or product and systematically check whether it adheres to a set of heuristics, you are conducting what is called a heuristic inspection or heuristic evaluation. It is a simple, effective, and inexpensive means of identifying problems and defects and is an excellent first technique to use before moving on to more costly and involved methods such as user observation sessions. It is usually best when a heuristic evaluation is carried out by an experienced usability specialist, but heuristic evaluations can also be very effectively when they are conducted by a team of individuals with diverse backgrounds (for example, domain experts, developers, and users). To conduct a heuristic evaluation, you should choose several scenarios for various tasks that a user would perform. As you act out each of the steps of the task flows in the scenarios, consult the list of heuristics, and judge whether the interface conforms to each heuristic (if it is applicable). An obvious weakness of the heuristic inspection technique is that the inspectors are usually not the actual users. Biases, pre-existing knowledge, incorrect assumptions about how users go about tasks, and the skill or lack of skill of the inspectors are all factors that can skew the results of a heuristic inspection. Heuristic inspections can also be combined with standards inspections or checklist inspections, where you inspect the interface and verify that it conforms to documents such as style guides, platform standards guides, or specific checklists devised by your project team. This can help ensure conformity and consistency throughout your application. This entry was posted in Interaction Design, Psychology for UX Design, Uncategorized, Usability, Usability Testing, User-Centered Design. Bookmark the permalink. 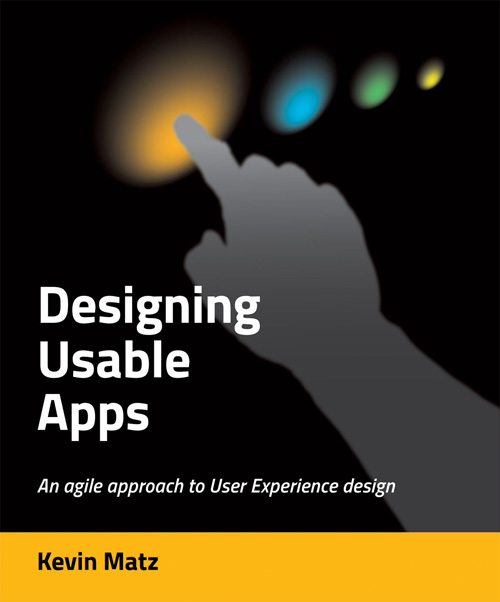 My book, Designing Usable Apps, is now available! Hi, I'm Kevin Matz, founder of Winchelsea Systems Ltd. and creator of the ChapterLab word-processing app. This is my blog about usability and UX design for websites and software products. Let me know what you think! What characteristics contribute to a negative user experience? What characteristics contribute to a positive user experience? How do users perform tasks, do work, and learn how to use software applications? What is involved in designing user interfaces for an application? What should you look for in a usability trainer? What is Information Architecture and why is it important in software application design? Copyright © 2011-2013, Kevin Matz, all rights reserved.